Medical research occurs at an incredibly-fast rate, and in no field is this more evident than cancer care, where new treatments and therapies are continually being unveiled. One of these is Proton Beam Therapy (PBT), a type of radiation treatment that uses protons rather than X-rays to treat cancer. After the protons reach the desired place in the body, they deposit the specified radiation dose in the tumour. With PBT, there is no radiation dose beyond the tumour. In contrast, X-rays continue to deposit radiation doses as they exit the patient's body. This means that radiation is also damaging nearby healthy tissues, potentially causing side effects. Because the beams can be so carefully targeted, PBT can be used on more-complicated cancers and on very young patients, making it one of the modern treatments of choice for certain selected cancers. Despite all these accepted benefits, PBT is currently unavailable in the UK. But this is about to change, with plans by the Department of Health to open two purpose-built PBT facilities at The Christie Hospital in Manchester and at University College London Hospital. 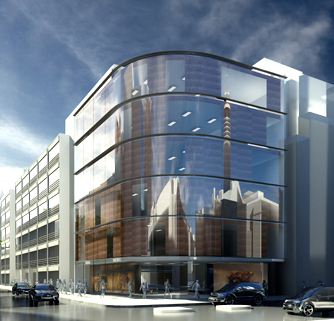 The Manchester centre is being designed by HKS Architects and will be built by Interserve Construction. 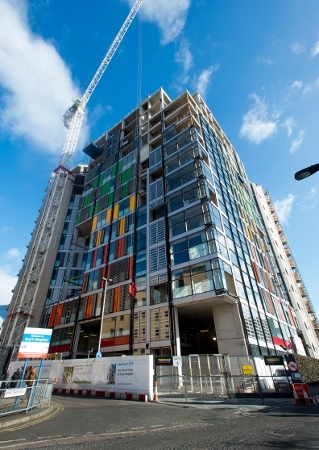 It will be the first to open, in late 2018, with the UCLH centre following after. The London facility is being designed by Scott Talon Walker architects and Edward Williams Architects and will be built by Bouygues UK. 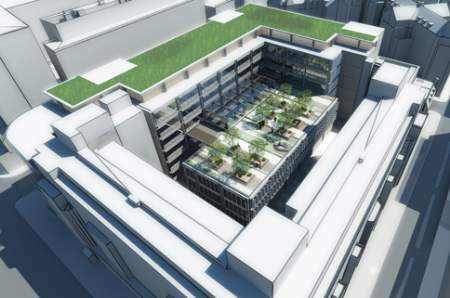 With a build cost of £90m and funded through the Department of Health via the Procure21+ framework, the five-storey building in Manchester will have a footprint of over 15,000sq m.
Speaking about the project, HKS’s lead designer, Franko Covington, said: “The beauty of PBT is that you can give patients a much-higher dose, but with less collateral damage. There are three distinct patient zones within the building – for adults, teenagers, and young children. 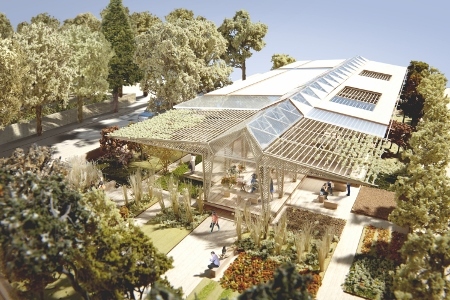 The adult zone is based around the Winter Garden, with a glazed waiting area which looks onto landscape with mature trees and lots of natural elements. It feels almost like you are in a parkland. There will also be a kitchen where people can interact and share their experiences. This can also be used by the parents of young children who can go there when their children are undergoing treatment. In contrast, the teenage area, which is separated off from paediatrics, has a foosball table and iPhone charging dock, together with breakaway seating areas were patients can interact or go into their own little worlds, as teenagers like to do. Younger children go through a different entrance and their environment includes interactive feature walls. In the children’s area there is also an anaesthetic room and recovery areas. “In all areas we have tried to integrate as much natural light as possible,” said Covington. Clinical and examination rooms separate the two distinct areas of the new centre, the patient waiting areas, and the treatment zone. 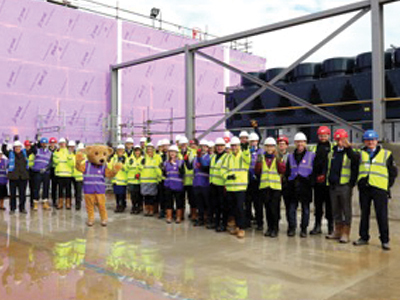 A concrete bunker, three storeys in height, houses the PBT machinery, which will service four treatment rooms, one largely for paediatrics, two for adult patients, and a fourth for research. 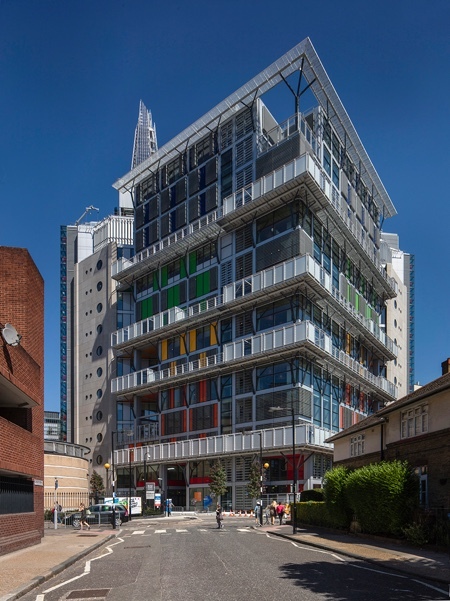 The whole building is five storeys, with outpatient clinics to be held on the ground floor and inpatient rooms on the top floor. “The building was designed around the clinical pathway from the very beginning,” said Covington. The part of the PBT machinery that generates the beam weights a whopping 290 tonnes, so this will need to be craned into position once the concrete bunker is complete and mechanical and electrical services are in place. The three-storey 360-degree rotational gantries will then enable the beams to treat the patient at any angle. “While we have been designing this building, the technology has been constantly evolving,” said Covington. 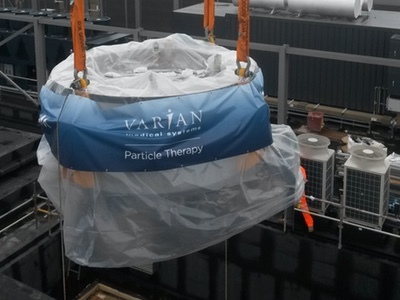 Arup is providing structures and M&E support to the project, while the radiation protection expertise is being supplied by Aurora Health Physics Services.